William Henry Hunt is a key figure in 19th-century English watercolour painting, his oeuvre defining the transition from the inherited 18th-century landscape style of clean, transparent washes to the bolder and more innovative use of the medium that characterises watercolour practice in the Victorian period. 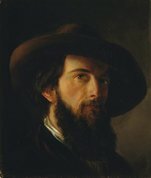 Highly prolific and extensively collected, Hunt not only made a comfortable living from his pictures but was also lauded by the influential writer and critic John Ruskin – who himself took painting lessons from Hunt – and admired by artists as diverse as Samuel Palmer, Dante Gabriel Rossetti and Walter Sickert. Hunt studied under the leading landscape watercolourist John Varley before enrolling at the Royal Academy Schools in 1808. 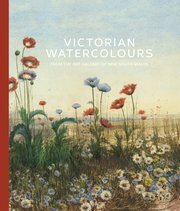 In 1814 he exhibited for the first time at the Society of Painters in Water Colours, becoming an associate in 1824 and a full member two years later. He maintained a long and active membership with this organisation, showing almost 800 works mainly of rustic figures, domestic interiors and still-lifes. In 1830 Hunt exhibited the first of many pictures of blossoms, fruit, nests and speckled eggs, which soon earned him the nickname ‘Bird’s Nest Hunt’. At the same time he also began producing a series of elaborately worked compositions of rural life, carefully recording the ramshackle interiors of mills, stables and workshops, which appeared strikingly original in their aspect of unaffected barnyard realism. The cow shed c1835-c1840 is a splendid example, with its slanting wooden beams almost obscured by the darkness and the scrupulously painted cow tethered in the stall. The figure of the old rustic, whose earthiness and immediacy of expression are brilliantly captured, adds human drama, Hunt having deliberately placed him on a stool by the barn door so that we can better observe his attitude of fatigue and annoyance at the scrutiny to which he is being subjected. A first-class technician, Hunt pioneered the use of Chinese white (a zinc-based opaque white pigment introduced in 1834), which he applied for highlights. He also found that mixing Chinese white with gum produced a hard ground that gave his colours additional brilliance when they were stippled over the top – an innovation that anticipates the Pre-Raphaelites. Hunt’s handling could also be surprisingly vigorous and inventive, not only in terms of his brushwork but also in his daring use of the knife to roughen, scratch or carve into the paper. This technique is particularly noticeable in the lower left area of The cow shed , where trailing white scratches embellish the depiction of painted straw, or along the contours of the seated figure where scraped-away paint layers suggest the fall of light from the open doorway.